Projects Abroad now offers the chance to do an internship with a Law firm in a truly unique environment. There are a wide variety of legal areas in which interns work, including corporate, financial and criminal law. All placements are based in Shanghai. The firm focuses on M & A’s and IPO’s. In addition, as the Foreign Legal Consultant, they work on funding and start-up companies in need of financial support. The firm's Attorneys are the best China has to offer and are not shy in asking the interns to participate at all levels of business transactions. An effort is made to tailor projects for the interns in accordance with their personal education specialty and goals. This allows the interns to grow in the field of their choice. In addition, introduction to Chinese business and social customs is emphasised so the interns may return with knowledge that is immediately useful in their respective countries. 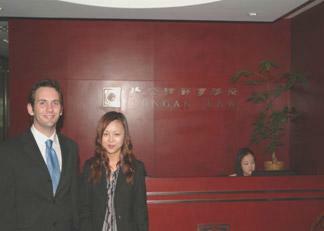 For further details please look at our project website www.internship-law-china.org. Alternatively please look at our Human Rights Law website www.volunteer-human-rights-ghana.org. Additional photographs and interviews with Projects Abroad volunteers are available upon request.